We made it to St. Martin! 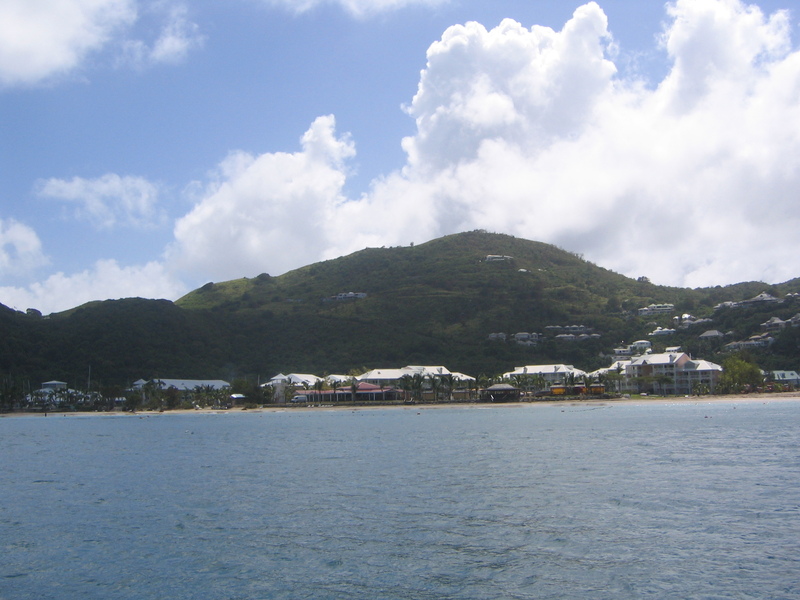 We arose early (4:00 am) on Tuesday to make the crossing from Virgin Gorda to St. Martin. We were delayed about an hour getting started as the port engine would not start (not good!). However, after some tinkering by the Pirate, all engines were a go and we were off. It was a gorgeous day, the seas were somewhat calm. The only negative was that the wind was on our nose the whole time, so no sailing to pick up speed. We averaged about 6 knots, which is alright. We decided to try our luck at fishing, and within an hour we caught our first fish- a Bonita. She was too small, so we threw her back. We alternated 2 hour watches and made the trip in about 15 hours. We arrived in the night, so it took some skillful navigating by the pirate to find the exact spot in Simpson Bay where we anchored last time we were here. We dropped anchor and thankfully the anchor held all night- we were exhausted. On Wednesday morning we took the dingy to check out our dockage situation at the Simpson Bay Marina. The website built it up to be this luxurious spot full of ammenities… well, let’s just say it did not quite live up to my expectations (the Pirate had warned that this may be the case- as Luxury in the Caribbean can range from “we have hot water” to “we will fan you by the pool and peel your grapes”). However, the dockmaster Stephan was very nice and worked hard to ensure that we had the best spot for our Cat since it will be there for two months. We decided to wait for a spot that was currently being occupied- the people were supposed to leave in the next day. Back at the boat, we decided to sail over to Anse Marcel and anchor there for a couple of days until our dock space was available. We love Anse Marcel because it is secluded, quiet and beautiful. There is a small marina tucked away with a quaint restaurant called La Louisianne. They are also in the process of converting an older hotel into a brand new luxury Radisson property. Because the resort is not open yet, there are no people on the beach, but we still use the beach ammenities- chairs, huts, and surprisingly an awesome bar that stays open for the locals. Unfortunately, La Louisianne was shuttered up, but a new french bistro called La Calypso had opened up next door. We had some of the best pizza’s there- one had smoked duck breast and honey-mmm, the other had ham, cheese and jumbo black olives- mmm. Thin crust just like we like them. The cajun had to revert to her French skills, as the waiters there did not speak English that well- but all was fine- we left fat and happy. It is now Thursday morning (I have been losing track of the days..). The Pirate is cooking breakfast- omelets and bacon- and the smell is making my stomach growl. Our plans today are to swim to shore and lounge around on the beach, maybe make some mudslides and cook a nice early dinner. We are heading back to Simpson Bay tomorrow to dock the boat. Tomorrow is Halloween- the Pirate and I have our costumes ready, all we need to do is find the party, which shouldn’t be hard to do in St. Martin.